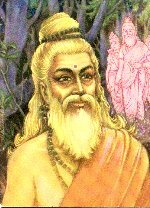 Vishwamitra was a sage in indian history who was known for his determination and will power against all odds. Though he was born into the warrior clan, his aim was to elevate himself to the status of "Brahmarishi", which was the highest position among sages. This was almost impossible at that time, but after undergoing penance, trials and many austerties, he at last obtained the title of Brahmarishi. He is known for standing up to his principles and not being afraid to do what he thought was right. He is also known for creating an alternate heaven, when his attempts to send a king in his mortal body to heaven was thwarted by the gods. Vishwamitra in Sanskrti involves "Vishwa" - universe and "mitra" - friend.